Marlborough is one of the world's most distinctive winegrowing regions, a source of the highest quality fruit, identifiably New Zealand Sauvignon Blanc. The growing seasons here deliver idyllic ripening conditions, whilst the extensive leaf removal regimens expose the fruit to sunlight, providing excellent flavour development. 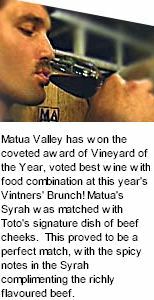 Matua Valley's winemaking team place considerable time and effort into achieving a Sauvignon Blanc that's fully expressive of Marlborough, showing consistent quality from vintage to vintage, setting the standard for others to follow. Vineyards are harvested throughout the cool of morning to ensure the least damage to delicate fruit flavours. The grapes are processed within hours of arrival at the winery, skins are separated from juices, pressed and re-introduced with the free run for a period of cold settling. Individual vineyard parcels are fermented separately in tank after inoculation to a variety of neutral and aromatic yeast strains selected specifically to enhance the distinctive natural expressions of each individual site. Following a cool tank fermentation the wines are racked off gross lees and allowed to sit on light lees prior to assembling into a wine with aggressive Sauvignon Blanc characters, herbaceousness and tropical. Soft in colour with green hues. Tropical and citrus fruits along with attractive herbaceous/ varietal characters on the nose. Gooseberry and apple dominate, whilst other crunchy orchard fruits are present, pear and nashi, melon with citrus, limes, floral notes and vegetable. The palate is generous and fruit driven with classical Marlborough acidity giving a fresh, clean palate and passionfruit finish.